I did this walk on Sunday 10th August 2008, driving down to Cooling from Walthamstow with Simon and Denis. We had a very clear journey down and arrived at the start point about half an hour early. 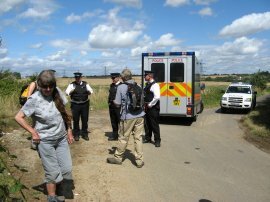 Whilst we were waiting outside Cooling church for the others to arrive we were stopped by the police who were very interested in what we were doing in the area as a result of the "climate camp" protest taking place at the Kingsnorth Power station a few miles away. 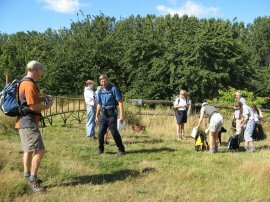 This resulted in names and addresses being taking and rucksacks being searched which is not the start of day you would typically associate with a walk through the Kent countryside and not entirely warranted given we were quietly sitting in a car some distance away from the power station. Sally turned up, and avoided being searched, and soon after the police left the other others arrived and we were able to set off. Link to BBC news item:MPs concerned at climate policing. 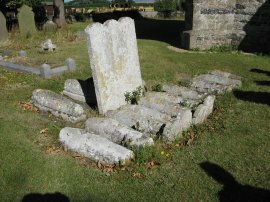 From Cooling we rejoined the Saxon Shore Way besides St James's Church where we stopped to take a photo of the group of small graves that features at the start of Charles Dickens Great Expectations where Pip meets Magwitch, photo 1. The route passes round the back of the church and some houses before turning down to rejoin the road through the village. The quiet road is then followed round a number of bends before the route turns off to the left along a track that runs between pear orchards to Bromhey Farm. 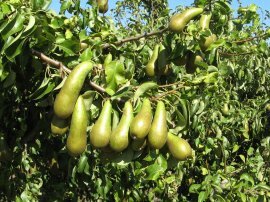 There were large numbers of pears on the trees, photo 2, but not quite ripe enough to eat yet. 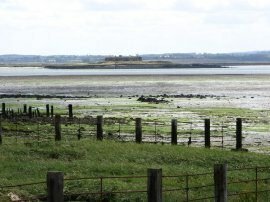 The route passes through the farmyard of Bromhey Farm, which forms part of the RSPB Northward Hill Reserve, and then heads along the edge of the marshes before turning to ascend Northward Hill. 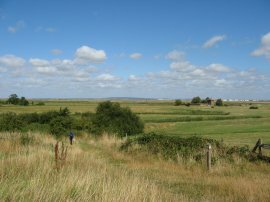 As we headed up the hill the views gradually opened up over the marshland of the Hoo Peninsula and over the Thames towards Canvey Island and the Benfleet Hills, photo 3. At the start of the hill we stopped for a short break besides a cherry orchard, photo 4. The route then passed through a very pleasant woodland stretch of path over the top of the hill before crossing over open fields near to High Halstow. 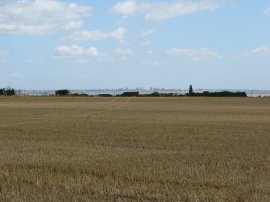 The air was very clear and it was possible to see Southend and Hadleigh Castle on the other side of the river Thames and ahead the first views of the Medway Estuary and over to Gillingham, photo 5. There was a very visible police presence in the area and overhead the sound of a helicopter disturbing what was otherwise a pleasant summer day. 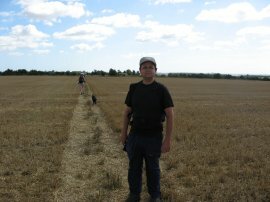 As we were crossing the fields Denis kindly took my photo, 6, hopefully not looking too much like a climate protester. The route crosses Decoy Hill Road and then turns to the right to head down Bessie's Lane, which in reality was little more that a rather overgrown hedge lined footpath running between fields down to a road. At least the path was dry, last time I had walked this section of the Saxon Shore Way the footpath had been equally overgrown but also extremely wet and muddy underfoot which had left me looking a right state when I reached the road. The route turns to the left along the road before turning to cross over the A228 and take a footpath that runs down another hedge lined footpath besides a petrol station where a few of the group stopped for the first ice cream of the day! Besides the path a warning sign had been attached advising of "rabbit holes on footpath". Reaching a house the path turns left along a driveway which eventually becomes a surface road. 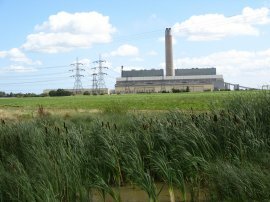 To the left there were good views across the Medway Estuary and also the Kingsnorth Power Station, photo 7. As we approached Roper's Lane we were met by more police, first just in a pick up truck but then two more police vans appeared followed by a number of officers who appeared on foot, photo 8. However we were soon back on our way, crossing Ropers Lane and heading down along a driveway towards a pond close to Tile Barn Farm where the route turns to the left to head between fields to another minor road. The route heads along the road for a very short distance before taking a footpath off to the right that gradually runs down to reach the sea wall alongside the Medway opposite the Darnet Fort, photo 9. The fort, which is a scheduled ancient monument, was completed in 1871 with one tier and 11 guns. The lower level of the fort has now been flooded to prevent vandalism. 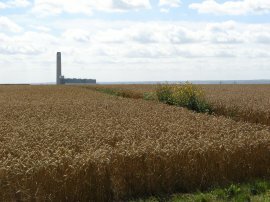 The path turns along the sea wall, photo 10, making its way up the estuary towards Upnor, this was also the closest that we got to the Kingsnorth Power Station, photo 11. 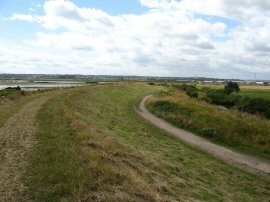 On the stretch of path to Upnor there are a couple of alternative routes for the Saxon Shore Way, one following the edge of the Medway, the other running slightly more inland. 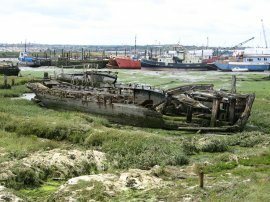 We chose the lower route as being the more scenic and made our way along the floodbank past a number of old abandoned boats, photo 12, a large collection of colourful houseboats and several marinas and yacht clubs, the path briefly heading inland through the Hoo Marina Park. 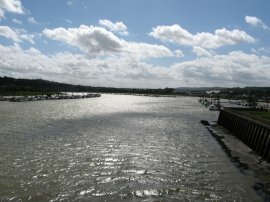 Last time I had walked the path I had walked both routes into Upnor, and the high level route, passing closer to Hoo St Werburgh did give very good views across the Medway Estuary. 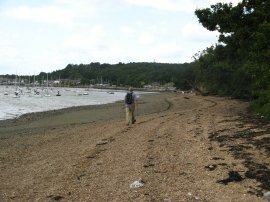 The path then heads down onto the shingle of the estuary itself, a route it may not be possible to always walk at high tides hence the alternative inland route. 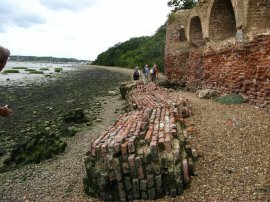 The route passes an old brick wall, gradually being eroded away, photo 13, and continues up the estuary, photo 14. 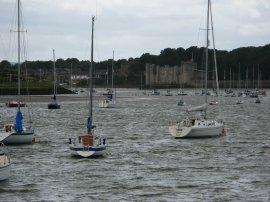 As we continued up river Upnor Castle came into view in the distance, photo 15. Upnor Castle is an Elizabethan artillery fort located in the village of Upnor, Kent, England. 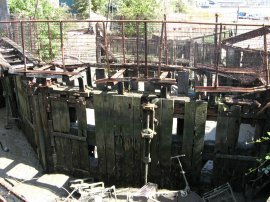 Its purpose was to defend ships moored on the River Medway outside Chatham dockyards. Nearing the castle we stopped for a lunch break on a small grassy slope besides the river, just over 8 miles from our start point at Cooling. 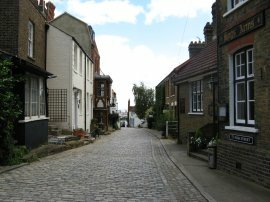 Having had our lunch we then joined a road that led round the back of Upnor castle to Upnor High Street, photo 16, which the path heads down back to the side of the Medway. After heading alongside the river for a short distance the path begins to bear inland, around the side of an MOD property on the shoreline before continuing along the footpath and crossing over the busy A 289 dual carriageway at a pedestrian crossing. We were making slow progress on this walk as both Denis and Simon were lagging behind the rest of group. While the route is generally well signposted there were a number of places where the route was not clear, as at the dual carriage way crossing, causing the others to wait to ensure we were all on the right path. Once over the A 289 the route heads up along a short stretch of footpath to join the Upnor Road. From here to the end of the days walk at Gillingham Strand, a distance of about 7 miles, the walk runs through the built up areas of the Medway Towns and here the Saxon Shore Way markers were very few and far between making the use of a map, or guidebook, absolutely essential to follow the correct route. Upnor Road heads steadily uphill, from where there were occasional views over the roofs of the large number of wharehouses and factories that have sprung up besides the river in this area, photo 17. Where the road turns to the right the Saxon Shore Way continues ahead along a footpath that drops steeply downhill besides an old chalk pit. 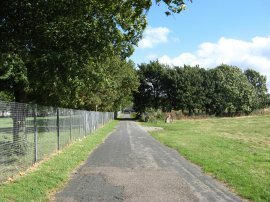 The route then crosses Commissioners Road and continues along another dingy footpath besides an abandoned industrial estate to reach Canal Road. 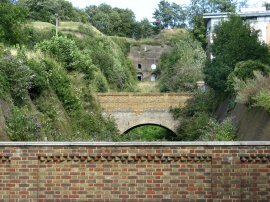 Just before canal road is reached the route passes the old lock gates that used to separate the Thames and Medway Canal from the River Medway, photo 18. Reaching the end of Canal Road the route crosses the A2 and then turns to the left to cross over the bridge over the river Medway from where there were good views upstream towards the North Downs, photo 19. 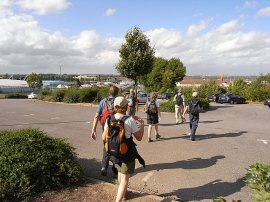 Once over the river the Saxon Shore Way turns down the Esplanade, briefly linking up with the route of the Medway Valley Walk, before heading up besides the flank of Rochester Castle, photo 20, to Bakers Walk where we stopped for a group photo besides the castle walls. 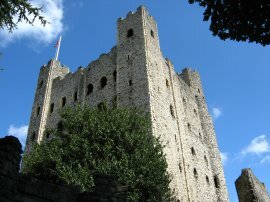 The route then turns to the left down Boley Hill which runs towards Rochester High Street between the castle and Rochester Cathedral, photo 21. Photos 22 and 23 where taken from Boley Hill. Here the group stopped for another ice cream break near the College Gate which featured as Japser's gate in Dickens unfinished novel, "The mystery of Edwin Drood". 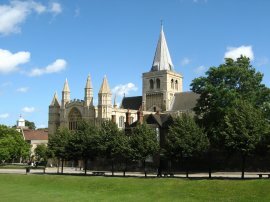 Rochester Cathedral is England's second oldest. The present building dates back to the work of a Norman monk, Gundulf, who came to England following the Conquest. 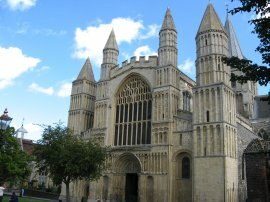 He was appointed Bishop of Rochester in 1077 and started construction of the cathedral in 1080. 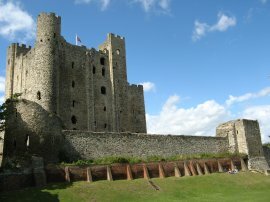 There has been a castle on the site opposite since Roman times (c AD43), though it is the keep of 1127 and the Norman castle which can be seen today. 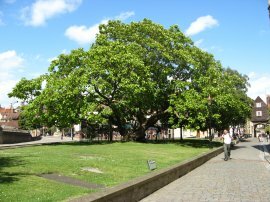 Having finished our ice creams, Simon managed to eat two, we headed back up past the Cathedral, passing an impressive Indian Bean Tree, photo 24, outside the Cathedral entrance which looked much older than its stated 100 years, before turning to our left along Minor Canons Row. The route makes its way round a couple of attractive streets, passing Kings School, and through the Vines, a small section of park where there was a tall figure of a monk carved from a tree that fell down in the storm of 1987. From this point the Saxon Shore Way takes a rather convoluted and not very photogenic route through the Medway towns of Rochester, Chatham and Gillingham. Leaving the Vines the route continues ahead along East Row and continues ahead along Gravel Walk and then along a footpath that runs gently uphill besides modern housing to cross over Delce Road and ahead for a short distance onto the join the A2 at Star Hill. Turning to the right the route heads briefly uphill before turning to cross the road and head into a park. The Saxon Shore Way heads through the park, passing some tennis courts on the left before dropping down to join a very roughly surfaced track that continues ahead then turning briefly to the right to cross a over a minor road, Fort Pitt Hill, before continuing ahead through another section of park from where there were very good views down the Medway Estuary, photo 25, and back along where we had been walking earlier in the day. At the end of the park, where we saw the first Saxon Shore Way marker for some considerable distance, the route turns to the left and heads down to cross over New Road Avenue and head down Hammond Hill which runs downhill to join Chatham High Street where the Saxon Shore Way turns to the right. The route soon turns left onto Medway Street and the at the end of the road, left onto Globe Road which is followed up to the A231 Dock Road. The route heads along Dock Road for some distance passing by the edge of Fort Amherst, photo 26. 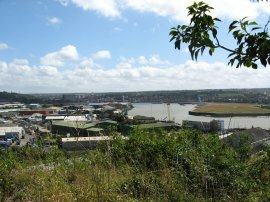 The fort was constructed in 1756 at the southern end of the Brompton lines of defence to protect the south eastern approaches to Chatham Dockyard and the River Medway against a French invasion and covers an area of some 36 acres. Simon and Denis had once again disappeared from view and after waiting for some time outside a petrol station on Dock Road a phone call elicited that they had decided to pay a quick visit to the fort which was free to enter on the day. The rest of the group continued along Dock Road before turning to the right and taking a footpath that heads steeply uphill besides some modern tower block. At the top of the hill the route joins Pleasant Row, continues ahead over Brompton Hill into Garden Street and then continues ahead into Sally Port, where Anne insisted Sally have her photo taken. At the end of the road the route continues ahead across the bottom of an open space, photo 27, known as the Great Lines. 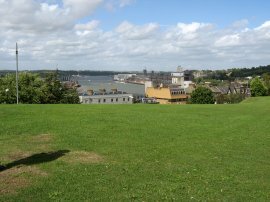 The Great Lines are an area of land reserved since the 18th century as the line of fire of the canons defending the Chatham Naval Dockyard. 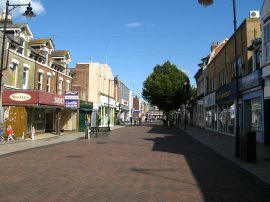 Reaching a road the route turns left down Marlborough Road and then left into the mainly pedestrianised Gillingham High Street, photo 28. Reaching the end of Gillingham High Street the route continues ahead into Railway Street, running besides Gillingham Station, before turning to the left into the residential Kingswood Road, the country walking and police presence of the first half of the walking seeming almost weeks ago rather than earlier in the same day. At the end of the road the route turns to the right, crossing over a disused railway line before taking a footpath off to the right from Parr Avenue. This leads to Church Path where the route turns to the left into Church Road for a few yards before turning right again along Gillingham Green and into the grounds of St Mary Magdalene. The path makes it way round three sides of the church grounds leaving along a footpath that leads to reach Christmas Street where the route immediately turns right down a path besides St Andrews Methodist Church. At the end of this short stretch of path the route heads briefly to the left to take a pedestrian crossing over the A289 Pier Road to finally reach Gillingham Strand where we finished this leg of the Saxon Shore Way. Reaching Gillingham Strand my GPS showed a total distance walked of 15.4 miles. Having arrived at the cars we then had to wait while Simon and Denis made there way back from Fort Amherst, by a more direct route which gave me the opportunity to have my first ice cream of the day. We then drove back to Cooling to collect the other cars and have a quick drink in the pub before heading home. The weather had been bright and pleasant all day although as we were leaving we could see heavy rain heading down the Thames over Essex and Denise rang to say it was pouring in Walthamstow. The last few miles after the old buildings of Rochester had been a bit of a plod but from Gillingham Strand it is back out into the countryside until Sittingbourne is reached. Last time I had walked the Saxon Shore Way I reached Gillingham Strand half way through what was then my stage 5, (from Stroud station to Rainham Station). Having cars at each end definitely makes things far quicker than having to do circular walks although fortunately I was able to complete all the rest of the walk going from station to station.